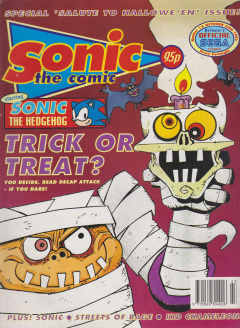 Sonic the Comic 12 is the twelfth issue of the Sonic the Comic series by Fleetway Editions Ltd.
1 Sonic the Hedgehog - "Hidden Danger!" 2 Kid Chameleon - "Kid Chameleon, Part 6"
3 Streets of Rage - "Streets of Rage, Part 6"
4 Decap Attack - "Starring Chuck D. Head! Part 3"
Sonic the Hedgehog - "Hidden Danger!" A panda and a hippo (both apparently named Sammy) see a blue falling star crash-land a short distance away, only to find out that it's really a cool blue hedgehog: Sonic. They take him to see Steve Owl, their leader, who tells Sonic that they are in the Hidden Zone, which is protected from Doctor Robotnik's rule of planet Mobius by a cloaking device. They ask how Sonic found them, but he can't remember. In fact, Sonic doesn't remember anything before fighting aboard Robotnik's latest Sky Fortress... not even his own name! Meanwhile, Robotnik is pleased that Sonic's fall has revealed the location of the Hidden Zone, which he has been looking for for years. He amasses his badnik armies and sends them out. When the badniks attack, Sonic and Steve Owl cower with everyone else as the badniks bombard the Hidden Zone from above. However, when a Motobug comments that he expected better from Sonic the Hedgehog, Sonic suddenly remembers who he is and defeats the badniks easily. He leads the Hidden Zone residents (and the animals freed from badnik casings) across a bridge and into the Emerald Hill Zone, where they can help the resistance against Robotnik. Kid Chameleon - "Kid Chameleon, Part 6"
Casey is in a fight for his life with a cyborg gorilla, and has lost his Chameleon powers! He has to rely on his own skills to save him, distracting the gorilla by throwing his skateboard in its face, then knocking it off the roof with a bodyslam. Finally he makes it to the last telepad and the end of the game. The Voice speaks again: with Suzi, who already escaped, he is congratulated as the only person to finish the game. Casey returns home, but it is now nighttime and his mother is tearfully telling the police that he is missing. When he turns up, he learns that he and Suzi have been out for half the night, and their parents were worried sick. Worse yet, Brad still hasn't returned home. Casey knows Brad must still be trapped in Wildside. There's only one way to beat it, and only one person with the power: Kid Chameleon has to go back to Wildside! When Casey leaves the arcade, there is a Sonic the Comic poster on the wall behind him. Streets of Rage - "Streets of Rage, Part 6"
Max Hatchet and his corrupt former partner Hawk battle as the processing plant burns around them. Outside, Axel has to restrain Blaze to stop her rushing into the inferno. During the fight, Max starts to feel his age. He's slower than he used to be - slower than Hawk - and he hurts his back when the pair fall onto a still-moving conveyor. As Hawk pins him down, preparing for the killing blow, Max finally finds the strength and kicks Hawk into the molten slag pit. Max staggers out of the plant, only to be accosted by Captain Wyndham, who wants Axel (who is still a cop) to arrest Max and Blaze for breaking the law. Axel resigns - by breaking Wyndham's nose. However, their friend Murphy refuses to resign, for the sake of his wife and son, and he helps Wyndham back to the car. Max isn't bothered though: he knows they'll need friends like Murphy on the force as soon as they really start dealing with crime! Decap Attack - "Starring Chuck D. Head! Part 3"
Someone (who may or may not look like Loyd Grossman, and may or may not be presenting Through the Keyhole) introduces the readers to the gothic dungeon, in which Prof Frank N. Stein and Igor are forced to construct an evil army of the undead. Then Max D. Cap throws him out a window. This is witnessed by Chuck D. Head and Head, who themselves were thrown off the building. Chuck apparently survived because the Prof gave him three hearts - only two are now working. Chuck initially has no desire to rescue the Prof, until Head points out that without the Prof's electric shock treatments he'll die, so they immediately rush to save Chuck's beloved "father". They break into the crypt (by using Head to smash the bars on a window) and stumble across a skeleton with a stake in it. Chuck takes the stake to use as a weapon, despite Head's fears that it might belong to a vampire... which indeed it does. The vampire becomes confused when it finds Head is not attached to Chuck's body, then overjoyed when Chuck reveals the massively oversized neck on his chest. It sinks its fangs into the huge neck, then faints after drinking some of Chuck's purple blood. Chuck is affronted by the criticism.